I started out the summer working as a Nursing Assistant at Children’s Hospital where I had my clinical assignment last summer. They floated me one day to the burn unit and the nurse asked me to watch her do the dressings on a 2-year-old so she could watch me do them the next time. As a senior nursing student, they allowed me to do some procedures under close supervision. The little boy stood in his crib as she began to unwind his dressings. As his burned skin was exposed, his blood ran down his legs and arms and he began to scream. I felt myself begin to black out and turned and sank into a nearby chair and put my head on my knees. After the blackness passed, I went out into the hallway. The nurse finished the treatment and came out into the hallway to check on me. I said, “I’m so sorry, but I thought I was going to faint. I have never witnessed anything like that before.” She said she understood and told the supervisor not to assign me to the burn unit again. They sent me back to the orthopedic unit where I was last summer. I guess I deal better with the kids in traction than the burned ones. His words shocked me, but I was willing to try anything since I had lost all joy in the Lord. The next weekend, I drove up to see a friend and hike at the state park. I stopped every 30 feet to rest. When I awoke on Monday, I was still dizzy and exhausted so I called in sick. After praying, I knew I needed to resign and return to my parents’ home to rest the remainder of the summer. I called the head nurse and told her the situation, and she said she understood. After seven quarters straight of school, with the last one in psychiatry and the demanding classes, my body protested from the stress. After two weeks of total rest, I began to feel like myself again and could smile and laugh. I read a helpful book by M. R. DeHaan MD called Broken Things. He said, “The Lord only breaks those whom He is going to make.” “Sunshine all the time makes a desert.” I saw that I didn’t need to push doors open, but just relax and let the Lord open or close the doors. His tenderness in giving me two months just to meditate and enjoy Him brought tears to my eyes. My Dad kindly drove our travel trailer to the state park a couple of hours away and set it up so my Mom and I could stay for the week while he returned to work. God gave Mom and me precious times together. Walks through the woods refreshed my soul while I listened to the rustling leaves and watched the butterflies flit from flower to flower. At night, the chirping crickets lulled me to sleep, and the singing birds awoke me every morning. How I thanked God for these blessings and restoring my health. Since 1976, I have had several other times in my life of total exhaustion when I burned the candle at both ends and pushed my body too far. As I read the passage in I Kings again about Elijah, he had just run for his life 93 miles from wicked Queen Jezebel who tried to kill him. No wonder he was exhausted. After he said to God, “It is enough! Now, O Lord, take away my life; for I am not better than my fathers.” And as he lay and slept under a juniper tree, behold, an angel touched him and said unto him, Arise and eat. And he ate and then slept some more and ate some more. He was able to go 40 days and nights after that. I realize I am certainly not Elijah, but the cure was the same for me. Sleep and eat, sleep and eat. The disciples grieved deeply after burying their beloved friend, John the Baptist, was beheaded by evil King Herod. I love the passage in Mark 6:30-31which says “And the apostles gathered themselves together unto Jesus, and told Him all things, both what they had done, and what they had taught. And He said unto them, Come aside into a desert place, and rest a while; for there were many coming and going, and they had no leisure so much as to eat.” It’s so wonderful that our dear Savior sees our needs and provides rest for us. 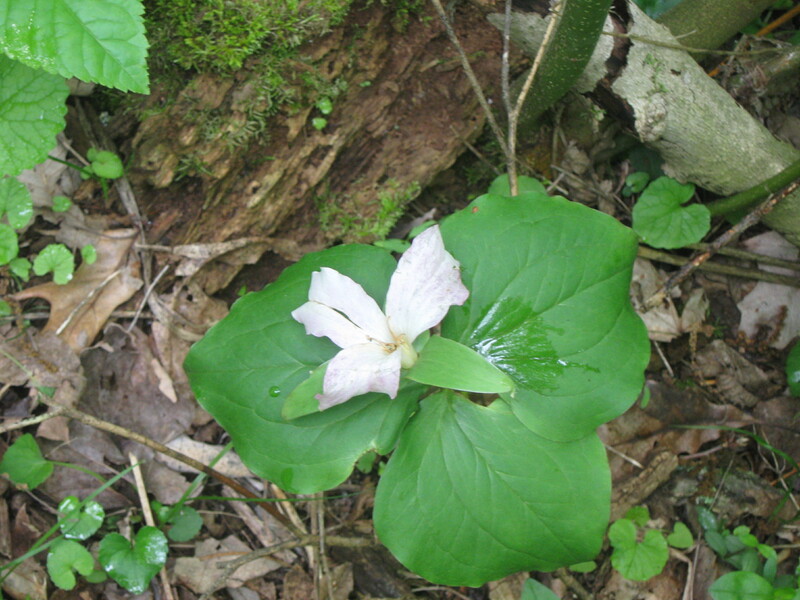 Three-petaled trillium wildflower reminds me of the Trinity. 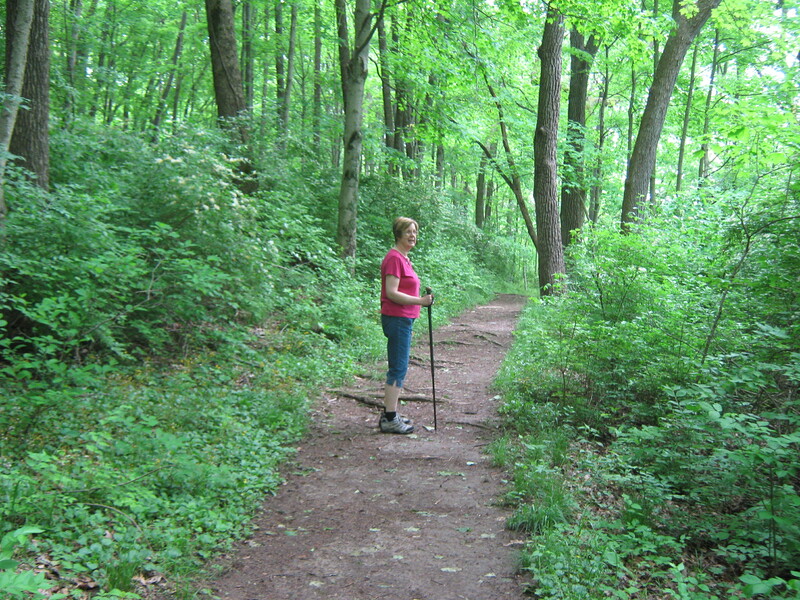 A restful walk in the woods with my sister, Marsha.